WordPress is a powerful Open Source blogging application. 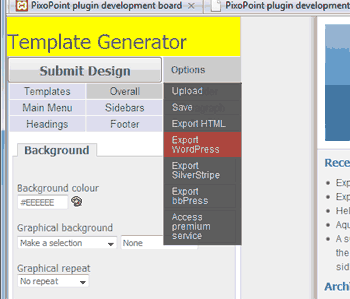 The PixoPoint template generator includes an ‘export to WordPress’ option to allow you to create a WordPress theme from scratch without needing to touch a single line of code! 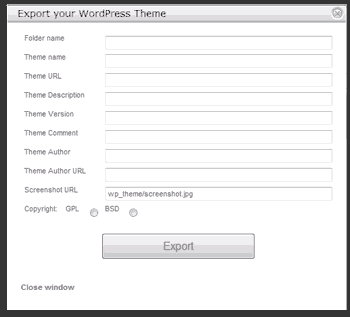 To create your own WordPress theme, design your site via the control panel and then choose the export to WordPress option (Fig. 1, ‘Export/import’ > ‘Export to WordPress’). A dialogue box (see Fig. 1.) will appear, showing various options which you may set in your new WordPress theme. You can leave most of these with the defaults, although you may wish to change the ‘Folder name’ and ‘Theme URL’ to differentiate the various themes you export from the template generator. Fig. 1. Enter the various details which will appear in your new WordPress themes documentation. What are all those options for? Some of the various options available in the ‘Export to WordPress’ dialogue box are used by your WordPress installation and some are used by. Folder name: This is the name of the folder which you will upload into your WordPress themes folder. Theme name: This is the name which will display in your WordPress admin panel when you activate the theme. Theme URL: If you write a page or blog post about your new theme then add the URL for it here so that others can find it. This particularly useful for anyone who is looking for support or help customising your new theme. Theme Description: This should describe the theme. This information can be useful for theme repositories as they can use this information as a short blurb about theme. Theme Version: If you release different versions of your theme, then you should enter the number here. The Comment: This can be a general comment about your theme. Theme Author: If you feel your design is sufficiently different from the original, then change this to your own name so you can claim credit for your new theme. Theme Author URL: If one exists, then enter the website for the theme author here so that others can find out more information about the author. Screenshot URL: This is the thumbnail image which will display in your WordPress admin panel when you activate the theme. Copyright: By default, most of the themes included in the template generator can be exported with either a BSD or GPL license. However some designs are based on templates which are only available with a GPL license. If you want to submit your theme to the official WordPress themes repository you will need to choose the GPL option. If you are only intending to use the theme for your own purposes then the license is unlikely to matter, so feel free to stick with the default choice. 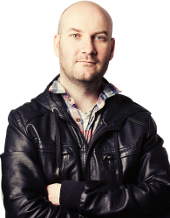 If you have any questions or comments, please leave a message in our support forum … https://geek.hellyer.kiwi/forum/.